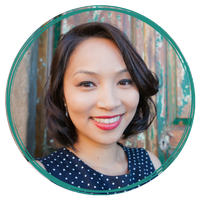 Hi, I’m Sara Nguyen, and on this channel, I make tech and social media easier for awesome entrepreneurs like yourself. If you’re new to this channel, consider subscribing for all of the latest product reviews, social media marketing tips and training. And at any time during this video, check out the description for links to all of the resources mentioned in this video. 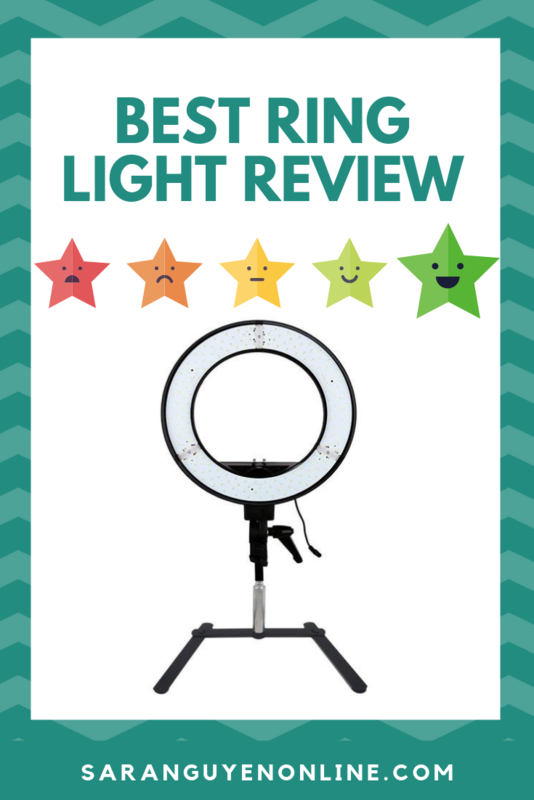 Ring lights have become extremely popular over the last few years, particularly with video creators looking to improve the quality of their videos with better lighting. You can typically tell if someone is using a ring light, by the ring reflected in their eyes. I have two ring lights, an 18-inch LED Halo Ring Light by Prismatic, which is available on Amazon and from dvestore.com and a 12-inch LED Ring Light by LUVO who are an Australian lighting supplier. I use the larger 18-inch ring light for all of my YouTube videos. The smaller 12-inch ring light I use for Facebook live streaming with my desktop or smartphone. Yes, I probably could use the 18-inch ring light for live streaming as well, but I like how the 12-inch ring light fits on my desk without taking up too much space. Here is what I love about the ring lights. The ring lights are extremely easy to set up and get started with; you take it out of the box, attach the filters which snap on, and it typically comes in a white and warm filter. Then you attach it to the tripod and turn it on by turning the dial. You don’t need to mess with any of the bulbs with the LED ring lights, and they last for a very long time, which is why I prefer them. I also like that there’s a dimmable light option, so you can adjust the light levels to get the lighting look that you prefer. If you’re using the ring light with a DSLR camera, you can place the camera in the centre of the ring light, or if you’re using a smartphone, you can attach the smartphone to the centre of the ring light using a cold shoe mount and a tripod mount. I recommend using a smartphone mount that is solid quality and that allows you to adjust the phone, landscape or vertical, such as the Glif or MeFoto phone mounts. You can also mount an iPad or tablet to it as well, but you will need a bracket for the iPad. Compared to the bulky space consuming softbox lights set up where you need multiple lights to illuminate you, your ring light becomes a one light solution. The ring lights don’t take up much space when they’re in use, and they come with a bag, making them easy to carry around and tidy when stored as well. The LEDs emit less heat than a regular halogen light bulb. When you’re recording, and you’ve got your makeup on, there’s nothing worse than sweating through the video. It’s not a good look, and it’s not very comfortable. I like the LED ring light because it doesn’t give off as much heat as a light bulb of softbox light. The quality of light from the ring light is beautiful. You get a soft light, so you don’t get harsh lighting that highlights shadows on your face or the bags under your eyes. It’s a flattering light that also hides blemishes and wrinkles. The Prismatic LED Halo Ring Light has 240 individual lights to illuminate you with a beautiful glow, and it also has dimmable lighting, allowing you to control the light with the dimming dial. What don’t I like about the ring lights? If you wear glasses on your videos, the halo effect from the ring light doesn’t look so great, even glasses with anti-glare coating aren’t able to escape the reflection from these lights. Getting a quality ring light can be expensive. We’re starting to see the price of ring lights decreased slightly these days, but compared to a softbox light, ring lights can be double the cost. It’s an investment. I’ve put the links to different ring light budget options so you can have a look and research them for yourself as well. So here’s what it looks like without the ring light. I’m only using the natural light from the window in the room. You can see how one side of my face is lighter than the other. Now we’re going to turn on the ring light. I have the ring lot about a metre and a bit away from me, and we’re going to turn it on and slowly adjust the dial until I get the lighting level that I like. My tip for getting beautiful lighting from your ring light is all in placement. The sweet spot for placing the ring light is about three to four feet, about a metre away. The closer the light is, the more of a shadow you will see. Personally, I don’t mind the shadow. I think you should embrace your shadow, the physical shadow, and the emotional ones as well. You do want to avoid positioning the light from underneath you or above you as this create spots on your face, and we don’t want that. When it comes to creating, I feel that there are no rules, only tools, so use this as a guide, but feel free to place the light closer or further away from you to get the look that you like. So there you have it, my Ring Light Review. We looked at the pros, the cons, I did a demo and shared some tips to get some beautiful lighting. If you found this video useful, give me a thumbs up and don’t forget to subscribe to my channel. 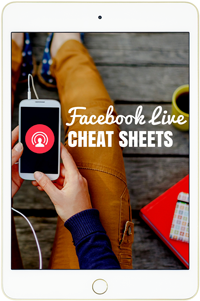 And if you’re looking for more ways to grow your business using video, Facebook live is a great way to get started but having an amazing ring light is just one part of the equation. You also need to figure out what to say, what other equipment you need and how to bring it together in a cohesive strategy.